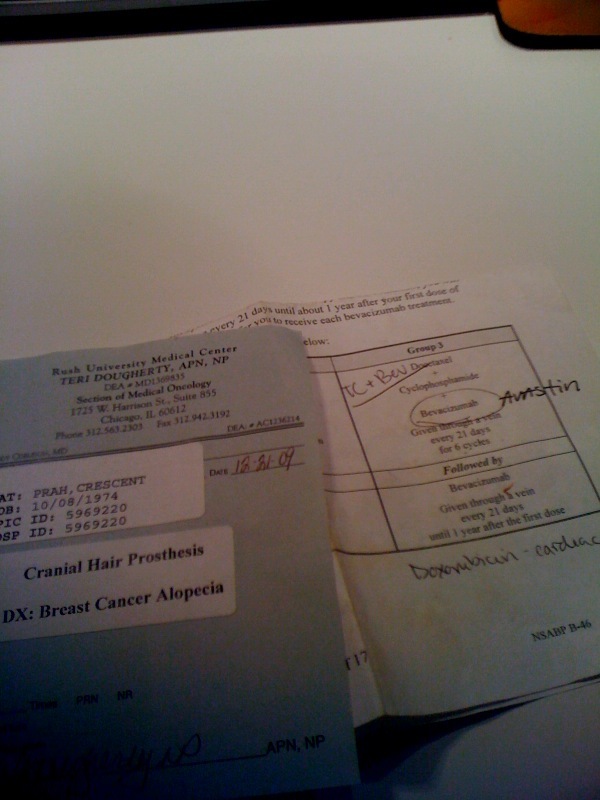 1. my prescription for "hair"
2. my treatment plan. I just finished that bugger last Tuesday finally. Then it dawned on me that a year ago today I started chemo. And today I'm getting ready for our trip to Cali, finally. I don't really know what else to say except it really wasn't that bad of a year. And I did it. And thank you everyone. And I can't wait to be on vacation for a few days. And I love you. Actually it's always been time to laugh but lately I've been enjoying some gutbusting hahas. That seems like a good sign. Last year I laughed a lot but there was less oomph behind it. Maybe I was worried too hearty of a laugh would bust my stitches or something. "WELL BUST MY STITCHES!" I'm going to start saying that with a southern accent every time something surprises me pleasantly. Anyway, I can also listen to music again without feeling like I might burst into a thousand and four pieces of sadness. Music was almost off limits for me last year which was a bummer because I really really love music. So it's back too. I think I'm just more alert now that my cells aren't being fried with chemo. I've noticed that my friends and family are outlandishly funny. Almost too funny. Almost. Like right now I'm Gchatting with my dad and he is being so funny that I am smiling and snorting at my desk like a crazy person. I actually just accidentally whispered "Daaaaad!" to myself in reply to his hilarity. That was embarrassing since he can't hear me but the people walking by me to head to lunch COULD hear my creepy whispers. My Dad: All good. Careful packaging. Not a crack in nay chocolate surface. Even the tails in the box were crisp. Of course it is very cold. Enjoyed the sweet and the protein. Me: tails? I don't know why but I'm horrified at that word in this context. My Dad: Well now that I have eaten them I can't double check. What are we even TALKING about? I don't know and I don't care. It just feels good to be happy-ish.